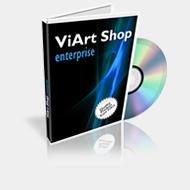 ViArt Shop is available FREE for evaluation and it has no limits in time. from the 'Evaluation' message a the top of the screen. Please, wait while download started. Or click here for direct download. If you are uploading ViArt Shop to your web-server via FTP, please remember that all files from /includes folder should be uploaded via BINARY MODE only. Included with ViArt Shop Windows Installer.